November, month of thrown fireworks and burning effigies, will see issue 49 of Black Static magazine landing on doormats across the country. It’s certainly better than having a banger stuffed through your letterbox. 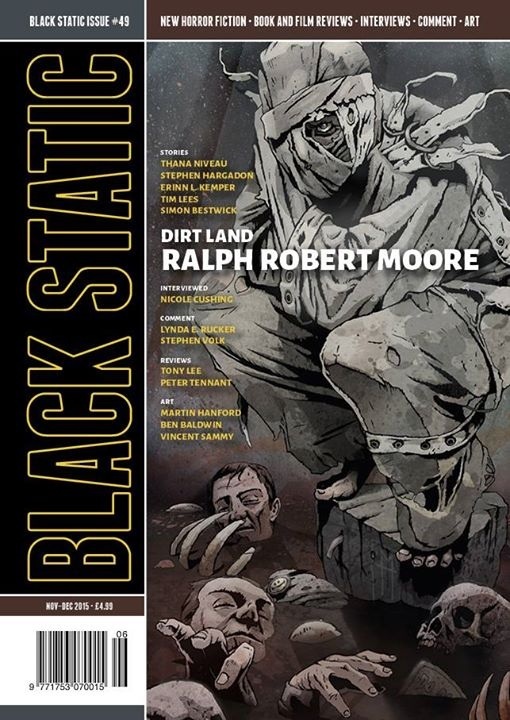 This issue features a 13,000 word offering, Dirt Land, by Ralph Robert Moore, while Martin Hanford provides the cover art. This issue includes a story of mine called The Toilet. It’s my fourth story to feature in Black Static, following on World of Trevor, The Bury Line and The Visitors. As a magazine, it’s a broad church. Readers who might think it restricted to blood and guts and rampaging fiends should take a closer look. There’s a real variety of writing to be found, detailing our many modes of terror, disquiet, pain, grief, loss, our human vulnerability. World of Trevor, my first short story to be published anywhere, appeared in Black Static 42. So to have another story in the magazine feels rather like coming home, if that’s not too presumptuous a comment. I’m looking forward to seeing the artwork. I hope you enjoy your visit to The Toilet.